Pancakes (also called “griddlecakes”, “hotcakes” or “flapjacks”) are popular around the world. Their history goes all the way back to Ancient Rome where the first pancake-like dish is said to have been invented in the 1st century AD. Known then as Alita Dolcia (“another sweet” in Latin) it was sold by vendors in the Roman market place. Here in Canada, they are often eaten for breakfast with butter and maple syrup. France specializes in crepes, a thin large pancake with a sweet or savory filling. The Dutch enjoy Pannenkoeken or Dutch Baby, a sweet souffled pancake, served with sugar and fruit. Even India has their own kind of pancake called Uttapam, made with blended batter of fermented rice and black lentil and mixed with spices and chopped onions. In Olney, England, pancakes not only serve as a tasty dish, they are also part of an important annual event, the all-female Pancake Race which began in 1445. It is said, inspiration for the race came about when a housewife came to church on Shrove Tuesday in such a hurry that she still had her frying pan in her hand, complete with the pancake inside. The race became an international event in 1950, and still continues on today with the Olney racers competing against the women of Liberal, Kansas. At GFA World in Stoney Creek, we have begun our own summer tradition involving pancakes, a free Neighbourhood Pancake Breakfast. GFA World, located at 245 King Street East, has been part of the Stoney Creek community since 1984 and our focus is to serve communities both in our local neighbourhood and around the world. 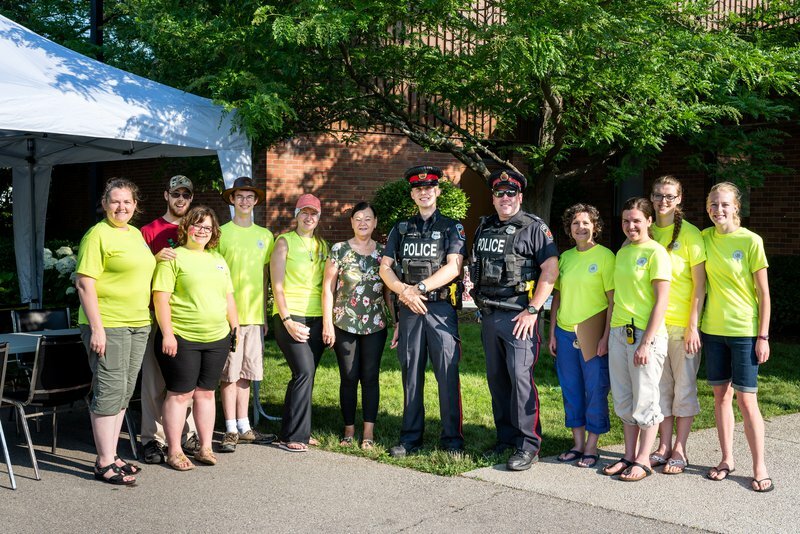 As a way to reach out to the community and build relationships with our neighbours, we host a variety of events throughout the year including our Pancake Breakfast, Easter Egg Hunt, Carwash, Fall Festival and Christmas Tree Lighting. As well as free food and fun activities, at each of these events we also take the opportunity to collect donations for the local Stoney Creek Foodbank. We have seen a generous response with many people bringing boxes and bags of non-perishable food items to benefit those in need. 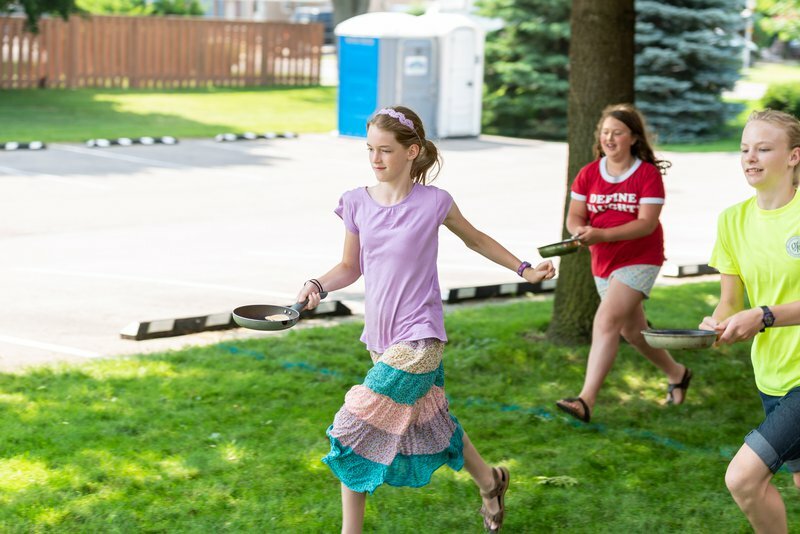 This year, our 2nd annual Pancake Breakfast took place on July 2nd. The event ran from 8:00-10:30 am and included free pancakes, a colouring contest, face painting, and games. A highlight for the children was the pancake race. For this activity each competitor is given a small frying pan with a pancake in it. They must race their opponent to the finish line, stopping at tossing points along the way to flip their pancake. The first person to cross the finish line with their pancake still in the pan is the winner. In honour of Canada Day, decorations were Canadian themed complete with maple leaf balloons and flags. Guests also had the opportunity to enter a Canadian colouring contest and win a prize for different age categories. Those who attended the Pancake Breakfast enjoyed being able to meet their neighbours and learn more about each other while sharing breakfast together. Ward Counsellor Maria Pearson, a guest at the breakfast, was thankful for the event and excited to visit with some of the citizens from her ward. GFA World extended a Pancake Breakfast invitation to the members of the Hamilton Police Department as a way to say thank-you for their service to the community. Two officers, who came out for the breakfast, spent some time chatting with the GFA World team and shared a bit about their experiences in the police force. 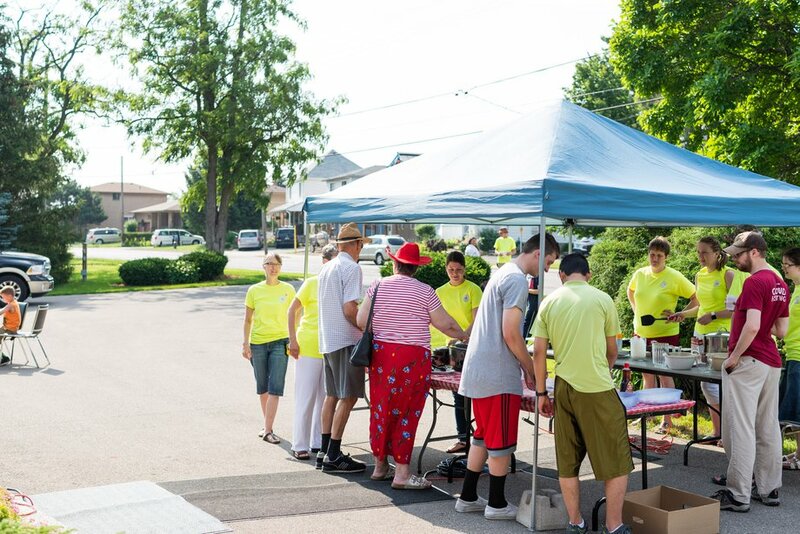 Whether it is through having conversations over pancakes, cleaning cars, singing Christmas carols or supporting the local foodbank, GFA World’s desire is to engage with the Stoney Creek community, building relationships and meeting the needs of those around us.